It's been a rough season for the Chicago Cubs, but the team has played better of late. One major reason is the pitching of Ryan Dempster, who has not allowed a run in his last 33 innings pitched. According to this article, "The 33 scoreless innings is the club’s longest such streak since Ken Holtzman in 1969 and is the longest in the major leagues this season." Based on Dempster's 2012 game-by-game log, I created the following chart of how many runs he has allowed in each inning he has thrown this season (you can click on the chart to enlarge it). 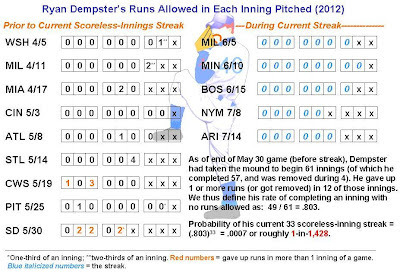 By looking at the games on the left-hand side, we can obtain Dempster's pre-streak proportion of innings started in which he retired the side without allowing a run. As detailed in the summary statement on the chart, that proportion is .803. We then apply this baseline percentage to the streak by raising it to the 33rd power (to represent the 33 straight innings). That calculation yields .0007, or roughly 1-in-1,428, for the probability of Dempster's 33 scoreless-inning streak, given his prior pitching proficiency this season. Because Dempster has pitched so well all season, allowing relatively few runs during April and May, the probability of his throwing 33 consecutive shutout innings, while not large, is not astronomically small, either. Note that, in his first nine starts of the season, in only two games did he give up a run in more than one inning. 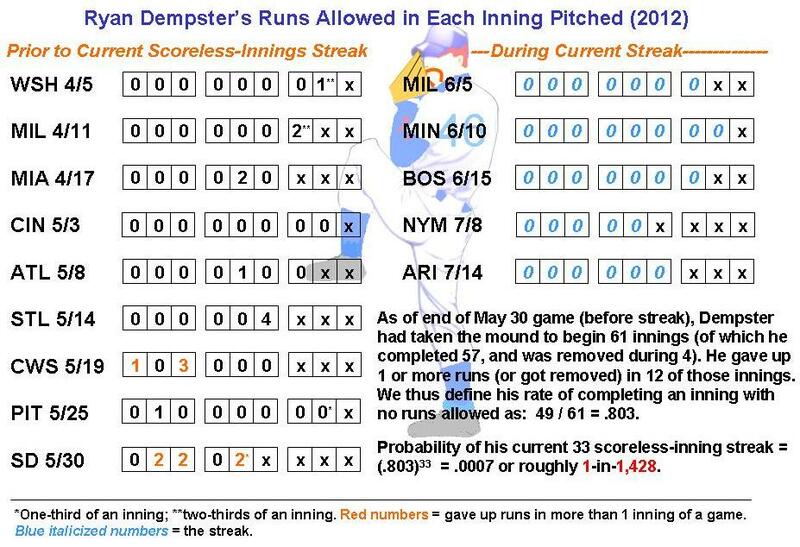 In fact, the statistics charted above don't do justice to how well Dempster has pitched, in my view. In his season debut vs. the Washington Nationals, for example, he was officially credited with allowing 1 run, in the 8th inning. As can be seen in the play-by-play sheet, Dempster pitched to three Washington batters in the top of the 8th (Chad Tracy, Ian Desmond, and Danny Espinosa), who respectively struck out, singled, and struck out. However, because reliever Kerry Wood allowed the runner to score, that run was attributed to Dempster. Dempster's next start is scheduled to be this Friday night at St. Louis, although he is the subject of rampant trade rumors as the Cubs seek to rebuild with younger players.